Flunoxaprofen is a chiral nonsteroidal anti-inflammatory drug (NSAID) that is closely related to naproxen. Flunoxaprofen has been shown to significantly improve the symptoms of osteoarthritis and rheumatoid arthritis. Amtolmetin guacil is a N-acyl-amino acid. Dipyrone sodium hydrate is a potent analgesic drug that has been demonstrated to inhibit cyclooxygenase (COX). Diclofenac is a potent and nonselective anti-inflammatory agent, acts as a COX inhibitor, with IC50s of 4 nM, 1.3 nM for human COX-1 and COX-2 in CHO cells, and 5.1, 0.84 μM for ovine COX-1 and COX-2, respectively. Mavacoxib is a veterinary drug used to treat pain and inflammation in dogs with degenerative joint disease. 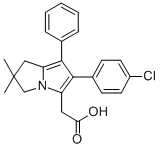 It acts as a COX-2 inhibitor. Aspirin DL-lysine is a non-steroidal anti-inflammatory drug (NSAIDs) that may inhibit cancer growth. Aspirin DL-lysine is a water soluble, injectable aspirin derivative. It is an analgesic; antipyretic; anti-inflammatory. Antrafenine is a piperazine derivative drug that acts as an analgesic and anti-inflammatory drug with similar efficacy to naproxen. Antrafenine is believed to be associated with the inhibition of cyclooxygenase activity. Two unique cyclooxygenases have been described in mammals. The constitutive cyclooxygenase, COX-1, synthesizes prostaglandins necessary for normal gastrointestinal and renal function. The inducible cyclooxygenase, COX-2, generates prostaglandins involved in inflammation. Inhibition of COX-1 is thought to be associated with gastrointestinal and renal toxicity while inhibition of COX-2 provides anti-inflammatory activity. 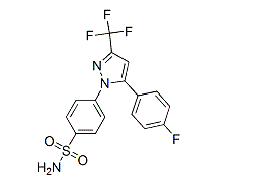 Licofelone (ML3000) is a dual COX/LOX inhibitor and the first member of this new class of analgesic and anti-inflammatory drugs. 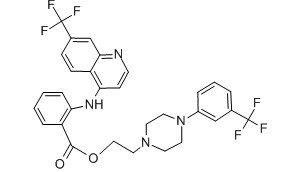 TFAP is a selective cyclooxygenase-1 (COX-1) inhibitor, with an IC50 of 0.8 μM. Ibuprofen Lysine is a non-steroidal anti-inflammatory drug.